Working in construction and manufacturing industries you become prone to different spills throughout your day. A spill contingency plan should be put into place to help outline what is needed to ensure a fast, efficient and safe response to leaks, sprays, spills and drips. A spill contingency plan identifies the right tools and supplies that need to be readily available in case of an emergency and to keep daily leaks and spills at bay. It is absolutely necessary to have the right spill control products, personal protective equipment (PPE) and decontamination equipment available at all times. Spills can come in all shapes, sizes and substances. Most spills can be grouped into four major categories – chemicals, oil, raw materials and air pollutants. The Safety Data Sheets (SDS) at your company should help you identify specifics of where a potential spill could happen. Detailed planning and prevention should be in effect before a spill happens. During this time you will review your plant/warehouse at least once a year or when changes take place. You should review any applicable regulations, develop and update your plan, put countermeasures in place and conduct trainings with your employees. The three organizations involved in spill compliance are OSHA, EPA and state and local agencies. Occupational Safety and Health Administration (OSHA) is concerned about the safety of people. In the case of a spill, OSHA wants to make sure workers are kept safe from slip hazards, toxic inhalation, chemicals getting on skin and water contamination. – All walking and working surfaces must be kept clean and dry. When wet processes are used, drainage must be maintained and kept free of corrosion, leaks and spills. or disposal of hazardous waste or emergency response when a hazardous waste is released. HAZWOPER aims to minimize the possibility of worker injury and illnesses resulting from potential exposures to hazardous substances. HAZWOPER requires that employers follow specific workplace policies and procedures to protect workers from hazardous substances. These standards provide your employer with information and training criteria necessary to ensure workplace health and safety during cleanup operations involving hazardous substances. – Spills can occur not only from a solid or liquid substance found in your workplace but the air that surrounds us. This type of spill is considered particulate or gas and vapor contaminants. The most common particulate contaminants include dust, fumes, mist, aerosols and fibers. While OSHA deals with workplace safety, the Environmental Protection Agency’s (EPA) main concern is to preserve waterways, soil and quality of air. The Resource Conservation and Recovery Act (RCRA) is the public law that creates the framework for proper management of hazardous and non-hazardous solid forms of waste. Under the Emergency Planning and Community Right-to-Know Act (EPCRA), Local Emergency Planning Committees (LEPCs) must develop an emergency response plan that is reviewed annually and provide information about chemicals in the community to citizens. Plans are developed by LEPCs with stakeholder participation. The EPA Facility Response Plan (FRP) requires certain businesses to submit a response plan to prepare for a worse case scenario of oil discharge or threat of a discharge. A FRP proves being prepared to respond to a worst case oil discharge. As part of the Oil Pollution Prevention regulation the FRP rule addresses FRP applicability, key elements that need to be included, certification the applicability of substantial harm criteria and FRP facilities with existing response or SPCC plans. In addition to EPA and OSHA federal regulations you should be aware of any regulations from New York State’s environmental protection agency, your local health department and other local government rules and requirements. 2. Identify and document possible spill types (oil, diesel, battery acid, etc.) Use SDS sheets to confirm if it is a significant spill. 4. Spill Response Plan – make a list of who to contact during a spill. Conduct employee trainings so they know how to handle a spill. Proper supplies should be on hand and should include spill kits, wet mops, PPE (safety glasses, gloves, boot covers etc.) first aid, pumps, absorbent mats or socks, or berms, plugging devices to stop leaks and drain protectors. 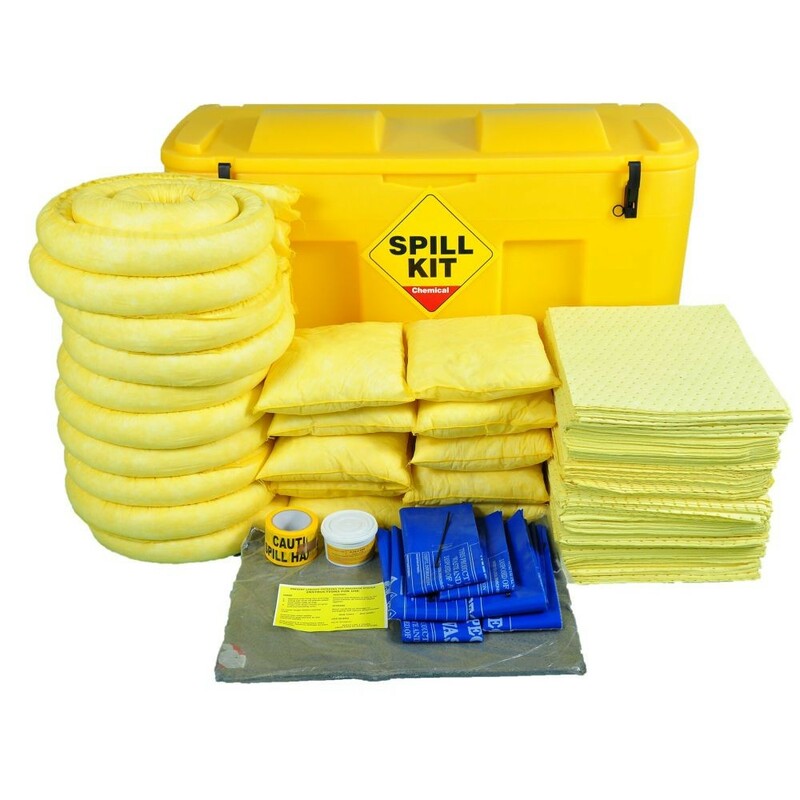 Spill Kits are good for spills up to around 100 gallons. They can reduce the potential of slips, trips and falls, reduce exposure to employees, prevent chemical release to sewer and waterways, be integrated as a part of a quick response plan and reduce risk and limit impacts of spills. What to do in the event of a spill? – How much leaked and how fast? – What is the location and direction of the spill? – Will the chemical go through ventilation systems? – Is the spill contained? – Was it incidental or hazardous? OSHA defines and incidental spill as “a release of a hazardous substance which does not pose a significant safety or health hazard to employees in the immediate vicinity or to the worker cleaning it up, nor does it have the potential to become emergency.” Incidental spills do not require an emergency response and do not require HAZWOPER cleanup.